With marathons all over the world, running a marathon has become a popular vacation activity. What better way to explore new places than to run through them, right? Why run through the streets of your hometown when you can run through stunning scenery in an exotic, faraway place, and then hang out and take in the sights? The marathon course takes you through all four Walt Disney World theme parks in Florida. You start at Epcot before dawn and run through the Magic Kingdom, Animal Kingdom, and Hollywood Studios before you finish back at Epcot. You’ll enjoy plenty of Disney entertainment during the race and can even get a picture taken with the many Disney characters who cheer for you along the course. The Walt Disney World Marathon is in January. The scenic course runs along the Silverado Trail on the east side of the valley and winds south from Calistoga to Napa alongside the many vineyards. Except for the last half-mile, the entire course is rural. Take in the views, but don’t drink and run (okay, maybe just a little). After the race, stay at one of the charming inns and spend the next day wine tasting and relaxing. 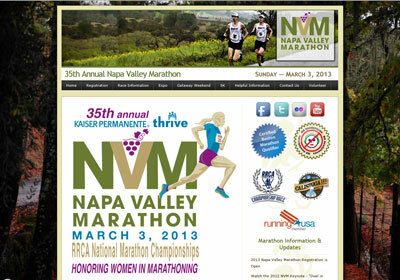 The Napa Valley Marathon is in March. If you like adventure, the North Pole Marathon may just be the marathon for you. Held in one of the remotest parts of the planet, the North Pole Marathon takes you to a place few people ever experience. With just 35 male and 5 female finishers in 2012, completing this marathon puts you in very small company. Including the 2012 race, 215 people from 34 nationalities have completed the North Pole Marathon. The North Pole Marathon is in April. The course starts on one of the most famous streets in the world, the Champs-Élysées, and runs a winding loop through the city, beside the banks of the River Seine, and past some of the city’s greatest sites, including the Eiffel Tower, Notre Dame Cathedral, and the Place de la Bastille before finishing near the Arc de Triomphe. Volunteers hand out red wine and cheese to runners at the Eiffel Tower, about three-quarters of the way through the race — just enough time to numb yourself before hitting the marathon wall. The Paris Marathon is in April. Another of the world’s most popular marathons with over 36,000 runners, the Virgin London Marathon runs around one of the world’s most visited cities. London has something for everyone: history, culture, art, grand museums, dazzling architecture, royalty, and diversity. And don’t forget the tea and crumpets! The course is largely flat and is nearby the River Thames, finishing near Buckingham Palace. During mile 6, you literally run across both sides of the world as you cross the prime meridian, the line that divides the earth’s Eastern and Western Hemispheres. The Virgin London Marathon is in April. No matter how well trained you are, you’ll literally hit the wall in this marathon. The Great Wall Marathon in China is the ideal way to combine an unusual running event with an exploration of one of the world’s most astonishing sights. The Great Wall Marathon is in May. The Berlin Marathon is one of Europe’s favorite marathons and is considered one of the fastest marathon courses in the world, with the most marathon world records being set there. Berlin is a culturally cool city, a hotspot for fashion, art, design, and music. Famous landmarks such as the Reichstag, the Brandenburg Gate, Checkpoint Charlie, and what’s left of the Berlin Wall make up a virtual three-dimensional textbook in a city where you’ll find history staring you in the face every time you turn a corner. The Berlin Marathon is in September. The Dublin Marathon is on the last Monday in October. The largest marathon in the United States with over 40,000 runners, the ING New York City Marathon is the cream of the marathon crop. To paraphrase Frank Sinatra, if you can run there, you can run anywhere. The marathon is organized by the New York Road Runners, the largest running club in the United States. The ING New York City Marathon is on the first Sunday in November. The challenging course that’s more than 2,500 years old begins on an ancient battlefield in the town of — where else? — Marathon, near the Aegean Sea, and climbs up toward Athens, about 360 feet above sea level. You finish in historic Olympic Stadium, the site of the first modern Olympic Games in 1896. The Athens Classic Marathon is in November. Enjoy spectacular ocean views as you run alongside world-famous Waikiki Beach and Diamond Head and Koko Head volcanic craters before finishing at Waikiki’s Kapiolani Park. After the race, soak your tired legs in the ocean and lounge on the sand. If you get there early, don’t miss the concert and luau at the Waikiki Shell a couple days before the race. The Honolulu Marathon is in December.